Next week is Spring Break! Wondering what to do? We've compiled a list of some local camps & activities HERE. The roles can be shared if you are interested click HERE for more information. Our Spring concert "The Wizard of Oz" is coming up on April 4th and 6th at 1:15pm and 7pm. Please find the volunteer sign-up sheet HERE and contact rebeccarutter7@gmail.com with any questions. ​Is your child in Grade 5, 6 or 7? Please see HERE for costume requirement details. Did you order an Emergency Preparedness Pack? Emergency Preparedness Packs have been delivered & can be picked up at the office. The tickets are online HERE for the March 6th show. Performers are FREE. Although tickets will also be available at the door, it is advised to purchase sooner, as line ups can delay the start of the performances. There will be no lunch time programs in term 3 as kids want to play outside and enjoy the great outdoors with their friends. Students are dismissed at 1:55 pm. Conference sign-up forms are located in the foyer. Free childminding service provided by our Grade 7 students will be available on a drop-in basis in the LAC room (upper level) from 2 to 6. There will be colouring, games, and activities. Please remember to sign your child in and out, if you use the service. Babysitting Certification Course: Registration OPEN! 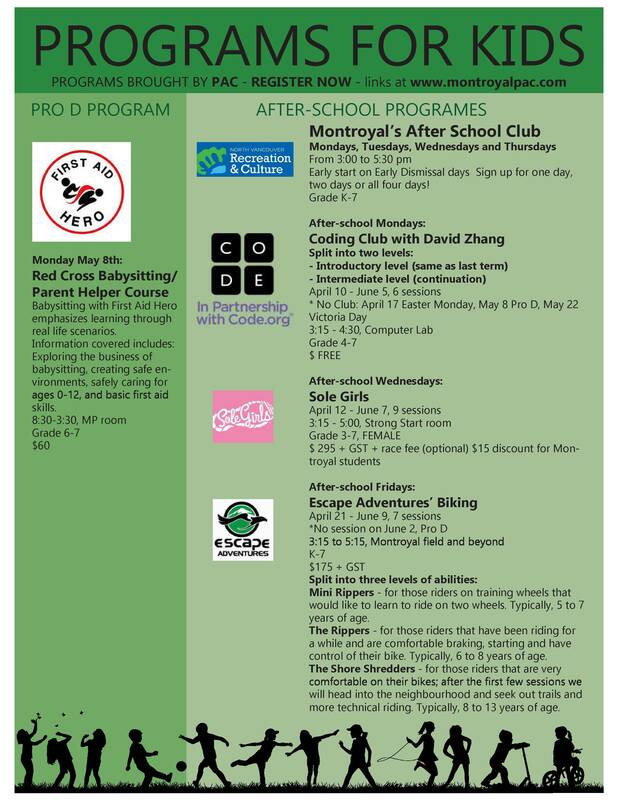 PD day course for Grade 6 & 7 students to be a babysitter or parent helper. Babysitting with First Aid Hero emphasizes learning through real life scenarios. Information covered includes: Exploring the business of babysitting, creating safe environments, safely caring for ages 0-12, and basic first aid skills. Click HERE to register. Tax deductible donations accepted through School Cash Online. More details will be provided after Spring Break. The grade 7 classes are raising money for their final farewell. Let’s support them by ordering a yummy treat! Every Friday starting March 31st we will be delivering TCBY to the classrooms. Ordering is available HERE. ​4 flavors to choose from!! Cotton candy, chocolate, vanilla & dairy-free orange sorbet!! ​Happy Easter! The Montroyal Grade 7 students will be fundraising with Purdy's Chocolates. This program gives 25% of the sales back to the class for grad activities. Brochures have been sent home. Deadline for orders is March 31st and pick up at the school will be Friday April 7th. Please place all orders on line. Vessey's Fundraiser: EXTENDED until March 31st! If it would stop snowing I could start thinking about my garden! The MPAC would like to assist in making your garden beautiful through our Vesey's Fundraiser. 50% of the proceeds go to the MPAC which provide educational enhancements to our children. Complete the order forms and make all payments to "MPAC". Deposit both in an envelope into the mailbox located in the front lobby by March 31st, 2017. Catalog and order forms were given to each student mid-February. Extra order forms are at the office beside the sign-out sheet and a sample catalog is posted on the PAC board at the front door. Orders are delivered to the school for pick up late April / early May. With this amazing profit margin, it's worth sharing with friends and family because it is your child who has the most to gain. Looking for a great family-friendly show? 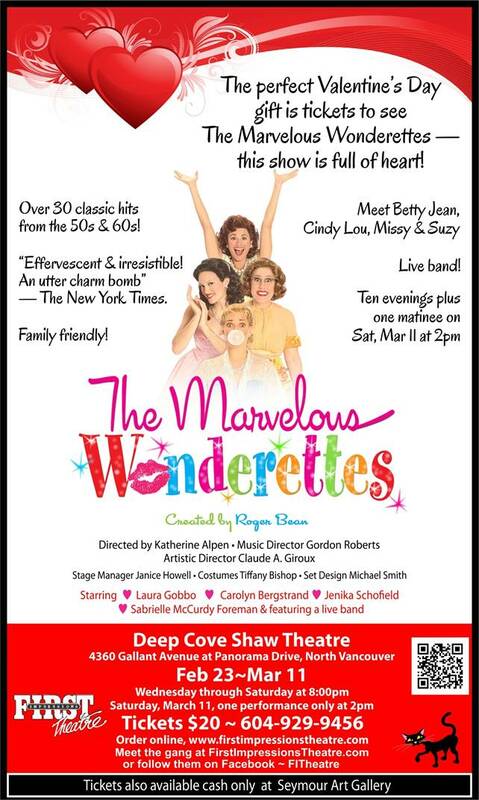 Check out The Marvelous Wondrettes playing at the Deep Cove Shaw Theatre between February 23 - March 11, 2017. School is not in session. School re-opens March 27th, 2017. Daytime concert for the school. 8:50 - 9:20 in the Montroyal Gym. April 4 & 6th Spring concert "The Wizard of Oz"
​One of the major benefits of membership with BCCPAC ​(BC Confederation Of Parent Advisory Councils) is the ability to help shape the public education system and influence partner groups. ​The Spring Conference will be held May 5th to 7th, 2017, additional information can be found www.bccpac.bc.ca.